I don’t know about you, but the busier I get the harder it gets for me to eat healthy or eat at all – which is why I began meal prepping last year. The Wendy’s 4 for $4 is so tempting, but when I’ve taken two or more hours out of Sunday Funday to meal prep – I tend to stick to what I’ve cooked, which is usually the healthier option. I’ve seen some gorgeous meal prep photos on Instagram. Every time I scroll through a hashtag search looking for inspiration, I think about how my meal prep never looks that pretty. I then try to guess what their grocery budget is for the week/month. I want to eat healthy and be summertime fine, but some of those meal prep posts look like some serious champagne lifestyle. With my goals to debt-free by the end of the year, I’m living on more of a lemonade budget. So for all of you out there that still want to eat healthy, I have five tips for meal prepping on a budget. Also, you may want to checkout my intro into Meal Prepping for some basics. About every other month, I head over to Sam’s and buy what seems like an illogical amount of meat for one person. I usually stick with chicken breasts or lean ground turkey, but will sometimes mix it up with some sort of lean fish. While I obviously can’t eat 10 pounds of chicken in one week, buying in bulk saves me money. I simply separate my bulk purchases into portions and store them in the freezer for future meal prep. FYI – Ground turkey and chicken can stay in the freezer for ~ four months. Would I love to eat blueberries all year? Absolutely, and so would my dog – yes, Sgt. Pepper is obsessed with blueberries. Unfortunately, when they’re not in season – they burn a hole in my pocket. I quickly learned that I could save some coins by sticking to buying produce that is in season. Produce is cheaper when it is in season because it doesn’t have to be shipped from other areas of the country. So before you add your fresh fruits and veggies to your list check out this guide to figure out what’s in season. Wait, Donni. Didn’t you just tell us to stick with what’s in season? I did, indeed, but stick with me for a minute. While my previous tip was to go with fresh seasonal fruits and veggies, that shouldn’t limit the types of fruits and veggies you consume. When you’re feeling like some “off-season,” fruits and vegetables – go with the frozen option. Frozen fruits and vegetables are a good alternative and may be superior to the off-season fresh vegetables sold in supermarkets. #4 – Spice it up! When I talk to my friends about meal prepping (this happens rarely) one of the things I hear the most is I can’t eat the same thing every day – it gets boring. Meal prepping doesn’t have to equal redundancy. For example, let’s say I’m doing something basic like grilled chicken. I usually season the chicken with two or more different combinations so that my meal varies slightly day-to day. Find simple ways to spice it up so that your flavors change a bit. #5 – Stick to the plan! Where I have and occasionally still mess up, is not sticking to my list. Damn you, Talenti Gelato! I’m not going to be the one to tell you to stay away from all of the goodies. Looking at the average age of this blog’s demographic – you’re an adult and sometimes you deserve to treat yourself. What I’m suggesting is to get your list and budget together beforehand. I am a couponer and sometimes I have to hit Trader Joe’s, Publix and Sam’s Club, before my shopping is complete. Just be mindful of the fact that just because something is on sale doesn’t mean you need it. I have one two many jars of Nutella because of the Publix BOGO sales. Le sigh. Make your list with your budget in mind and when you get to the store stick to the plan! 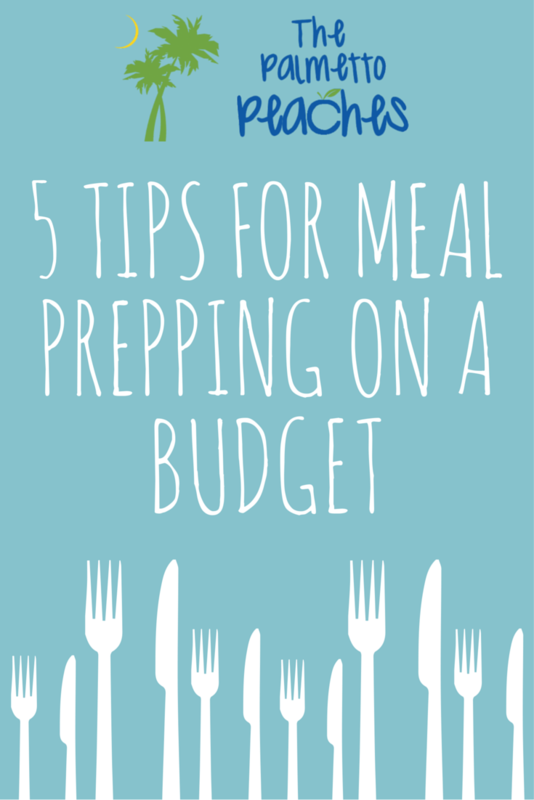 Do you have any tips for eating healthy and meal prepping on a budget? Please leave a comment below. These are great tips. I always love all the meal prep photos I see online and it totally motivates me to do that as well. The Wendy’s deals can be so tempting after a long day at work and I really find if I have at least shopped for groceries for the week, even if I haven’t cooked them all then I’m less likely to eat out. I know exactly how you feel. Knowing I have groceries or a prepared meal at home makes it easier to pass on the fast food options. Thanks for reading! These are great tips! I think people forget that frozen veggies are sometimes better quality than the stuff in the produce section. When I’m able, I also like to shop at the Farmer’s Market, because I know I’m getting better quality fruits and veggies and the price is often almost the same (and all the money to goes to the farmer instead of the grocery store)! Yes, I love my local farmer’s market. We used to have one that would come to my job which made it so convenient to get fresh fruits and veggies. Fantastic tips! I’m a big planner when it comes to meals – I find that I save money when I plan well! Agreed! It’s so helpful to go in the store with a plan and know what’s on sale, rather than walking around aimlessly and buying things that are already in my pantry. Thanks for reading. This is great! I like to meal plan and this will definitely help. Agreed – not only the planning, but not eating out as much. Thanks for reading! Those are great tips. Buying certain items in bulk saves us a ton. I have to avoid buying perishables at the big box stores because it’ll go bad. Yup, you definitely have to figure out which products makes the most sense for you to buy in bulk. Thanks for reading! These are great tips! As a vegan I like a lot of fruits and veggies. I only buy produce that’s in season and we end up saving a lot of money! Awesome! You’d be surprised how many people don’t realize why they are paying so much for certain fruits and veggies – they’re not in season. Thanks for reading! I have a family of 6. These are great tips. I meal plan and freezer cook. It helps keep costs down. These are great tips, and I totally agree! Such a great post with awesome tips! When I was training for a bikini comp…that never happened because I got pregnant!, I meal preped like a crazy person. It’s hard sometimes! If only we had a personal chef, right? Btw, I love your dogs name and gelato is the bees knees and so is Nutella! Aw, thanks! Sgt. Pepper thanks you as well. 🙂 A personal chef would be awesome. Let’s try to make that happen. Great and essential tips for meal prepping on a budget. Shopping within season makes such a huge difference! Thanks for your tips! I have really been slacking on the meal prep lately. But I’m eating Talenti Gelato right now as I write this comment, and it was on sale… sooooo I’m going to count today as a win. Absolutely — gelato for the win!! Thanks for stopping by.